Henry IV and Midsummer Are Almost Here! 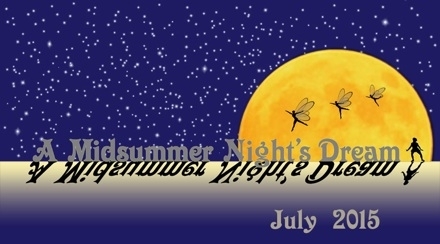 ISC's 2015 summer season features the second production in our series of Shakespeare's history plays, along with the ever-fresh, ever-funny modern favorite, A Midsummer Night's Dream. Henry IV picks up about a year after the end of Richard II, and the situation is largely the same as at the end of the previous play. Henry has deposed and murdered the rightful king and is wracked with guilt; he wants to make a voyage to the Holy Land for absolution, but instead he is forced to deal with the rebellions against his rule that are cropping up all over the country. The most serious rebellions are those in Scotland and Wales, led by the Earl of Douglas and Owen Glendower. He sends Henry Percy, aka Hotspur, and Edmund Mortimer to deal with these insurrections — and by doing so, he sows the seeds for all of these leaders to join together against him in the rebel coalition that he will have to face at the battle of Shrewsbury. At the same time, Henry's oldest son, Prince Hal, is a constant embarrassment, drinking and carousing in the taverns with Falstaff and his crew of prostitutes and thieves. Unlike in Richard II, where Hal's misbehavior is only mentioned briefly, in the Henry IV plays the Hal-and-Falstaff storyline is so prominent that it threatens to take over the plays completely. Shakespeare weaves these different storylines together brilliantly so that they converge multiple times, at the battle of Shrewsbury and, later, in the final moments of Hal's interactions with his father and Falstaff. See the shows for free! Shakespeare's first Henry IV play, what we know now as Henry IV, Part 1, was probably written in 1596-97, a year or two after Richard II. It was easily his most popular play in his own time. 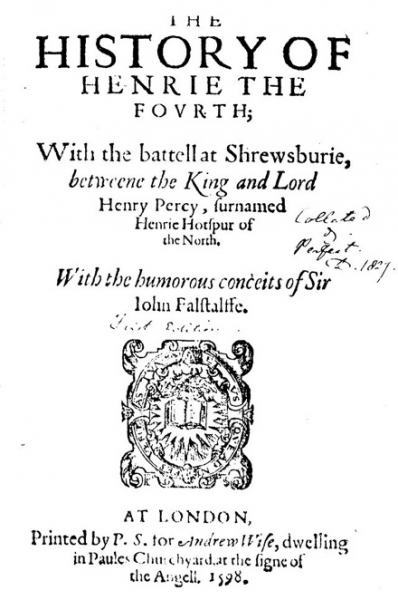 Its title when it was first published — really more of an advertising blurb than a title — is a perfect guide to the things that Shakespeare's audiences liked most about it: The History of Henry the Fourth, with the battle at Shrewsbury between the King and Lord Henry Percy, surnamed Henry Hotspur of the North, With the Humorous Conceits of Sir John Falstaff. The epic battle, the character of Hotspur, and the irresistible comic appeal of Falstaff are just as enjoyable for modern audiences; and when they are combined with the family drama between Henry IV and Hal and the acute examination of the consequences of Henry's political actions that forms the moral core of Shakespeare's history series, the result is one of the most complete and satisfying plays that Shakespeare ever wrote. This first Henry IV play was so popular that, in true Hollywood fashion, it generated a sequel and a spinoff (Henry IV, Part 2 and The Merry Wives of Windsor). Scholars are still debating whether Shakespeare intended from the start to write two Henry IV plays or whether the second was only conceived in response to the popularity of the first part. There's no way to know for certain, but the most reasonable explanation seems to be somewhere in between — he started with the intention of writing one play, realized that he had too much material, and then decided to divide it into two parts. 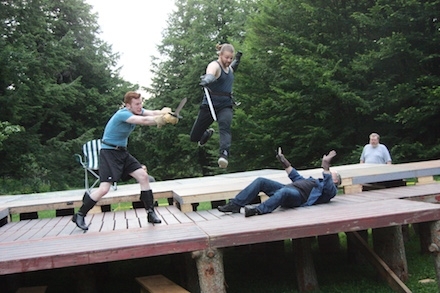 ISC's production weaves together material from both Henry IV, Part 1 and Part 2. The goal was to cover the whole arc of Henry's reign — and the whole arc of Hal's relationship with both his father and Falstaff — in a single production. Obviously, that meant that a lot of material from both plays had to be cut — 68% of the total text of the two plays combined, in fact! — but we think we have managed to keep the most important elements of both plays intact, even in this compressed form. 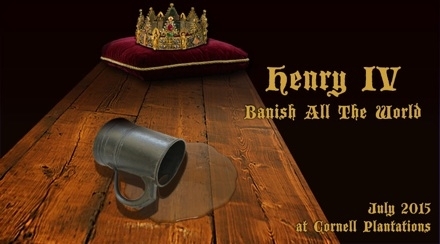 Henry IV is comedy, drama, history, and adventure all rolled into one. The rowdy comedy of Falstaff and his tavern mates blends into a moving exploration of the relationship between father and son, all leading up to a climactic battle featuring some of the most spectacular fight choreography we've ever had. Don't miss it!